Somehow I'm still at 26 pounds gained, which is bizarre because I feel like I'm growing by the second! I don't really "crave" specific things, but I have had a bit of a sweet tooth which I've been satisfying with lots and lots of fruit! We've gone through a watermelon, cantaloupe and a pineapple this past week. There's a tiny bit left, but not much...I'll probably kill the rest of it as soon as I'm done posting. I've also been enjoying lots of berries and my morning shakes! YUM! I've been trying my best to get some kind of a workout in a few times a week, this is not easy because by the end of the day I'm just SO done! The only shred of motivation I have left in the evening is thanks to my challenge group...honestly without those ladies pushing me I doubt I'd be unrolling that yoga mat or picking up a weight. Even though I'm rocking a bit of the flappy arm, I've noticed my arms have definitely toned up over the past few weeks. It's my own version of toned, but I'm proud! I spend a good portion of my workouts trapped in what I call the "upside down turtle". 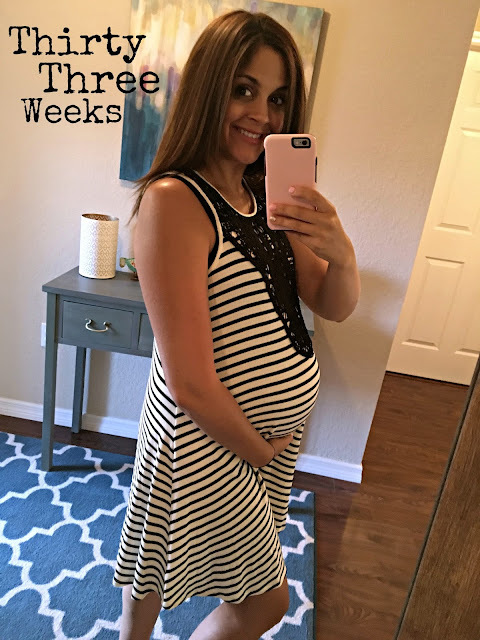 I read my 33 week bumpdate with Ella, and it is just so spot on! I don't usually read them before writing these updates but wow if you want to know basically exactly how I feel about trying to be a normal functioning working adult WHILST being pregnant....read it! Throw in being a mom to an almost three year old and...well, I need more naps built in to my day! I'm going to go eat some melon and struggle to stay awake to watch another episode of Game of Thrones. We have a busy day tomorrow! Wish us luck as we attempt to take a few maternity photos in this ridiculous heat! Click HERE to check out 33 weeks with Ella Rose! *Fun fact....I wore the green tank top I'm wearing in the Ella bumpdate post to bed last night. My belly sticks out the bottom. It has obviously shrunk in the wash. Yeaaaa, let's go with that.